The pope sends out his first tweet from his own account on Wednesday. 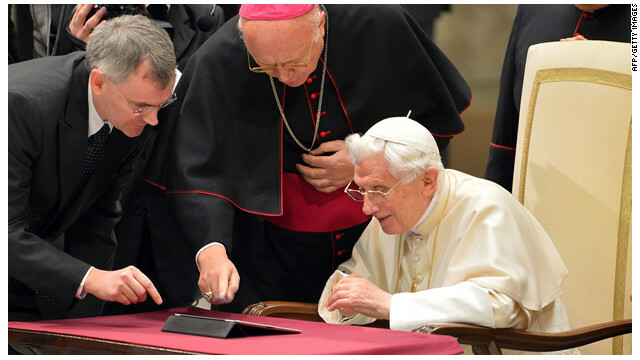 (CNN) - The wait is over for Pope Benedict XVI's many Twitter followers, and they have been quick to respond to the much anticipated first tweet from his personal account Wednesday morning. Using the handle @Pontifex - meaning "bridge builder" in Latin - he posted: "Dear friends, I am pleased to get in touch with you through Twitter. Thank you for your generous response. I bless all of you from my heart." Distraction is Satan's mission is to keep you away from the Word of God by all means! (Revelation 19:13 And he was clothed with a vesture dipped in blood: and his name is called The Word of God) *Matthew 27:25 Then answered all the people, and said, His blood be on us, and on our children. *Daniel 9:8 O Lord, to us belongeth confusion of face, to our kings, to our princes, and to our fathers, because we have sinned against thee.